There is no other season that I like to highlight more than in the summer. Luminous, dewy skin almost personifies summer in a form--the health that radiates from your cheeks in the summer heat, the glow you get after a long day spent by the pool or beach. 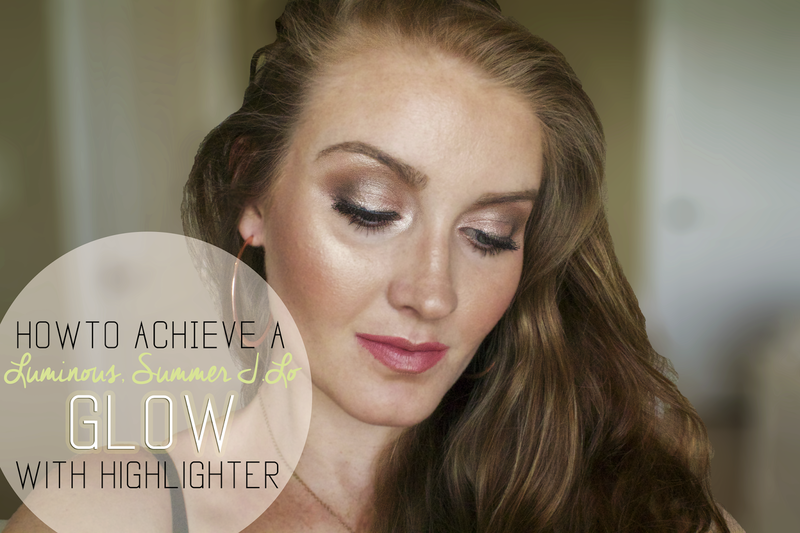 Regardless of the season though, highlighter is a great way to imitate that luminous, summer glow. Highlighting can even serve to accentuate or enhance certain features (like faking larger lips or eyes) because the added light draws the eyes to that area. You can use a variety of different products to achieve dewy J.Lo skin, whether it be liquid, cream or powder highlighting products. My favorite highlighter at the moment is Becca Shimmering Skin Perfector in the color "Opal." It's an indescribably beautiful champagne highlight with a golden sheen. Literally cannot put it down. 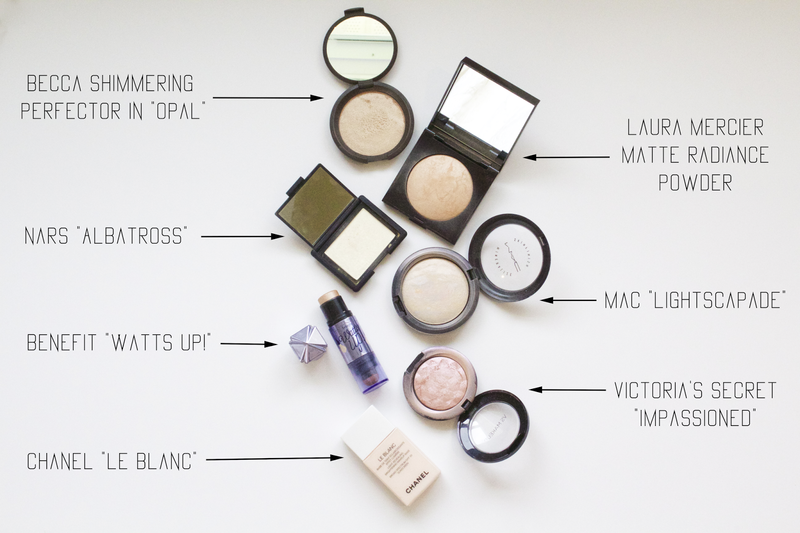 Almost all of my favorite highlighters seem to be in powder form, in fact. I think they give a great glow without looking too wet or oily. If your skin is really dry though, you might prefer a liquid or cream highlighting product. I highlight more or less depending on the mood I'm in (which is how I go about doing my makeup in general). If I want to ooze Victoria Secret Bombshell, I go for the entire enchilada and highlight all of the areas mentioned below. If I want to keep it more casual though, I only choose one or two areas. Like I said, it just all depends on my mood that day. I find that highlighting looks even better when added to an already contoured and highlighted face. The type of highlighting in this post focuses strictly on bringing added light and glow to the face. Highlighting paired with contouring like in this other blog post focuses on putting different shades of color in the appropriate areas to create a slimmed-down, multi-dimensional look. 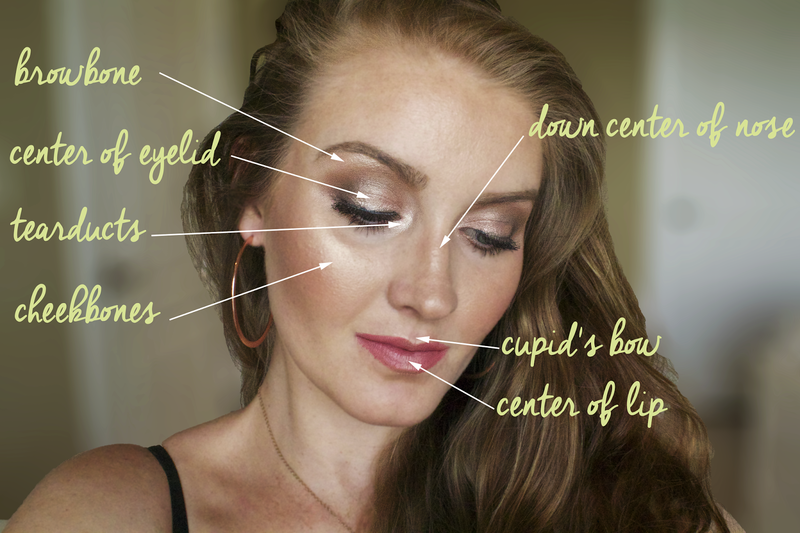 Cheekbones- highlighting this area will draw the eyes upward and into thinking that the cheekbones are higher. This is also a natural spot where health and radiance shine through after a workout or long day in the sun. Center of the lips- highlighting in the center of the lips will create increased dimension so that the lower lip looks larger and more plump. Browbone- highlighting this area will clean up the area under the brows, make the arches appear higher, and make the entire eye area seem larger. Tear Ducts- highlighting next to the tear ducts of the eyes creates that "wide awake" look and will fake larger eyes. This is a great tactic if your eyes are close-set and will make them appear farther apart. Center of Eyelid- After applying eyeshadow, packing a lighter highlight color in the center of the lid will draw attention to this area. This will make the eye lid area more dimensional and in turn, create a larger, rounder eye look. It also just looks really pretty!Down the center of the nose- I would be careful with this one. If too much highlight is applied to this area, it can look oily really fast. A light touch is key here. A light touch of highlighter down the center of the nose will draw the eye down the thinnest portion of the nose and trick them to think its slightly smaller.